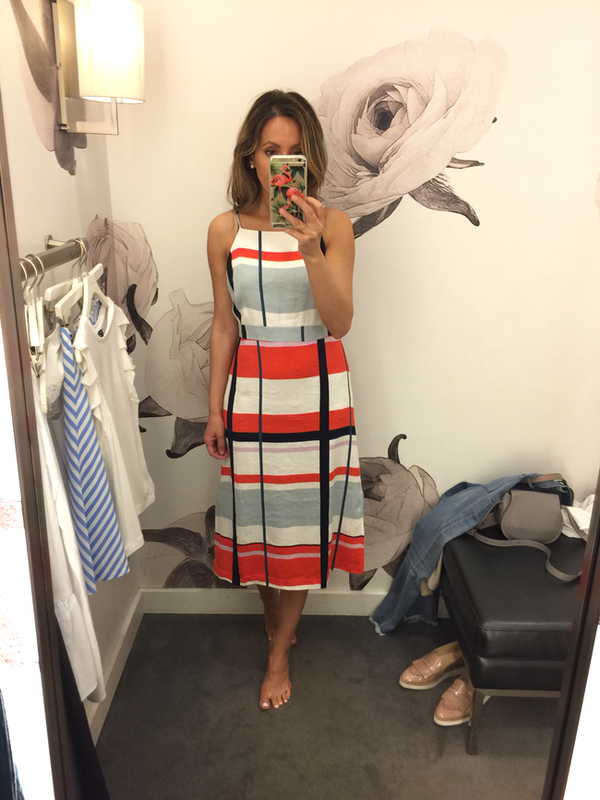 Fitting Room snapshots – Nordstrom, Ann Taylor – SO good! 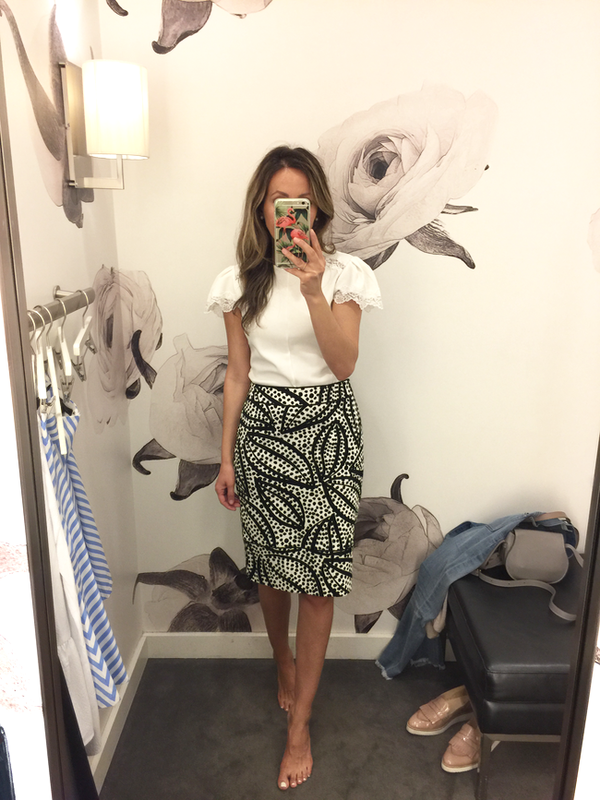 All these fitting room snaps are thanks to me trying to find ONE top for a specific skirt. One top! 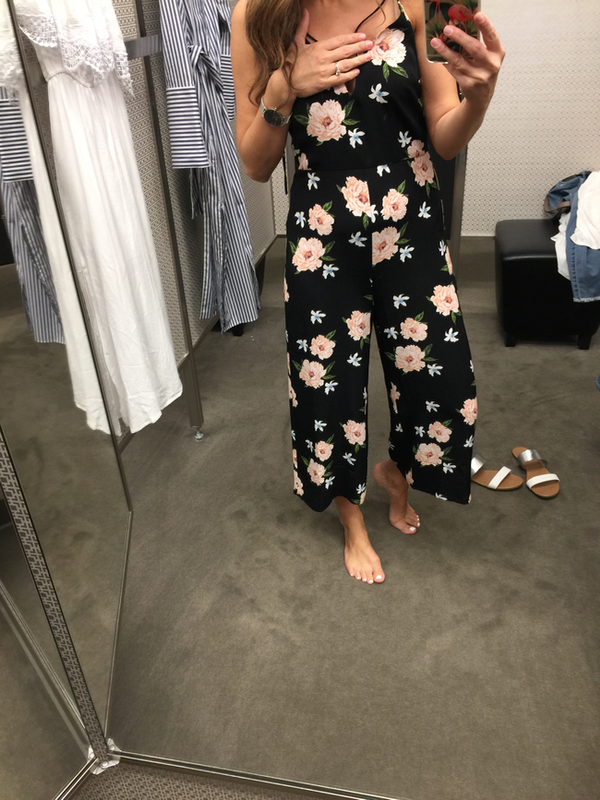 I was also on the hunt for a pair of cute slides…but I’m sure I’ll find everything I’m looking for once I don’t need it for a specific occasion (isn’t that how it works?!). 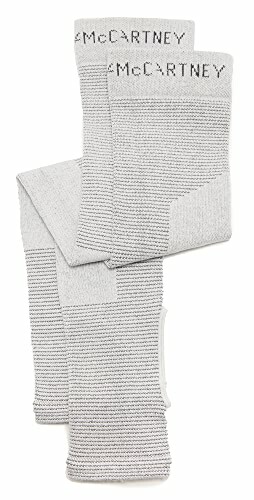 I’ve been eyeing a couple of pairs from Madewell (simple and cute). But clearly can’t decide. Send help! 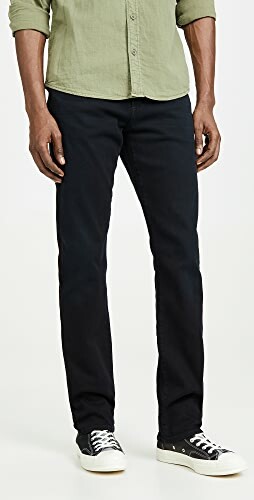 I’ll start with Ann Taylor (everything is currently 40% off w/code ALLOUT. woohoo). 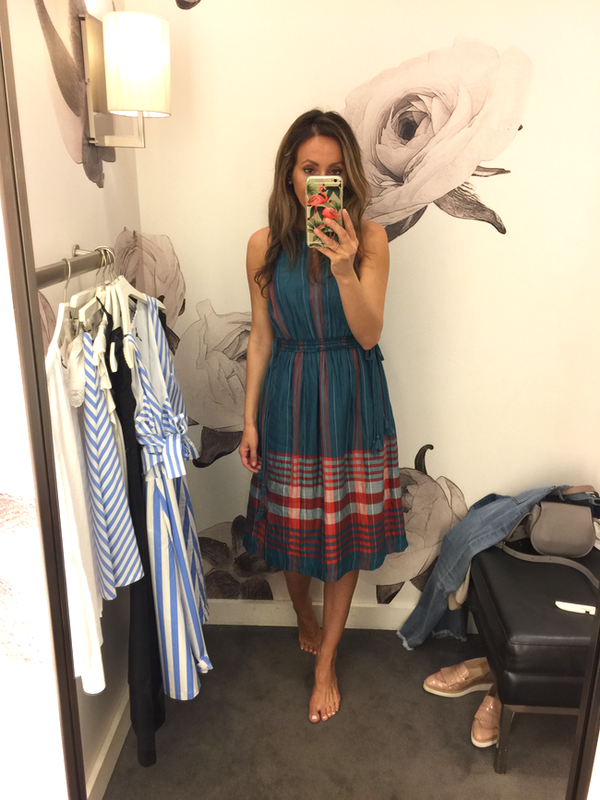 A lot of pieces from my previous fitting room snaps are on sale + extra 40% off. 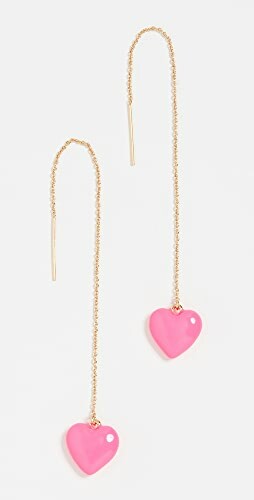 Stopped at the store to look for one top but had to try some extremely cute pieces. 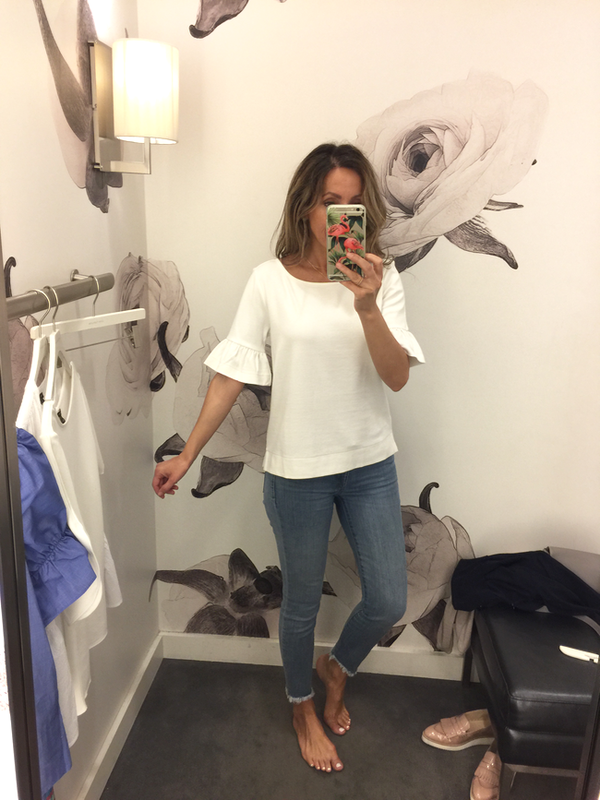 I wasn’t hating anything I tried on (It did seem as if I had more stuff in my fitting room….might have forgotten to try on a few pieces). 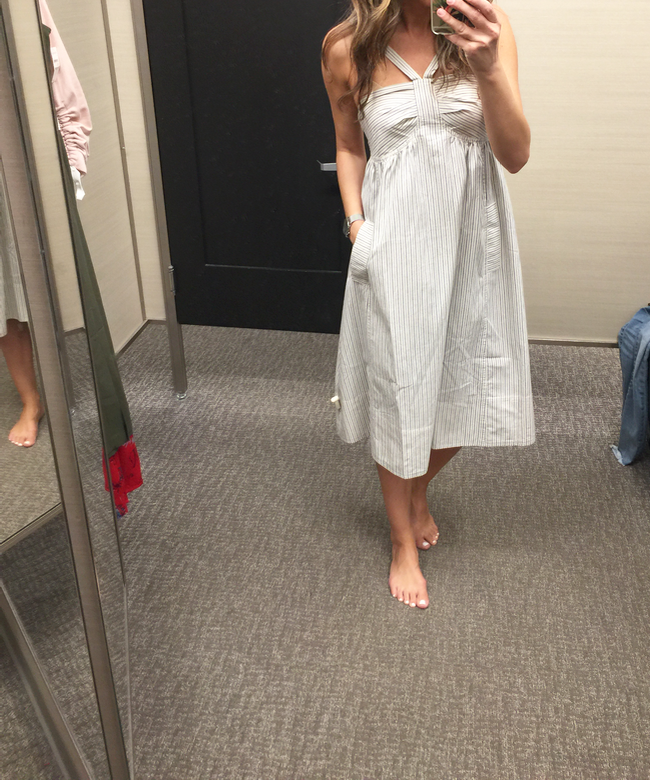 This dress was not available in my size but had to try it on. SO SO Cute! 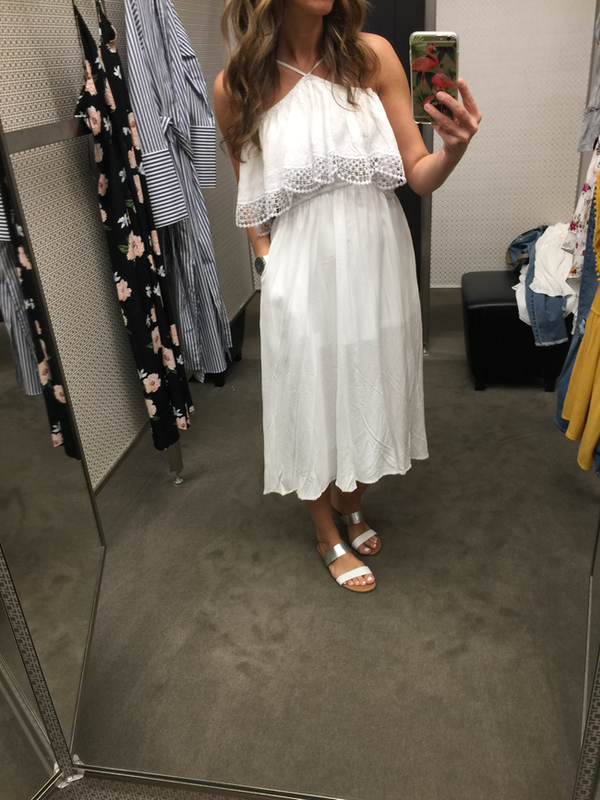 Really trying not to buy more dresses (how many times did you hear my say that?!) but this one is on top of my wish-list now. It is gorgeous! 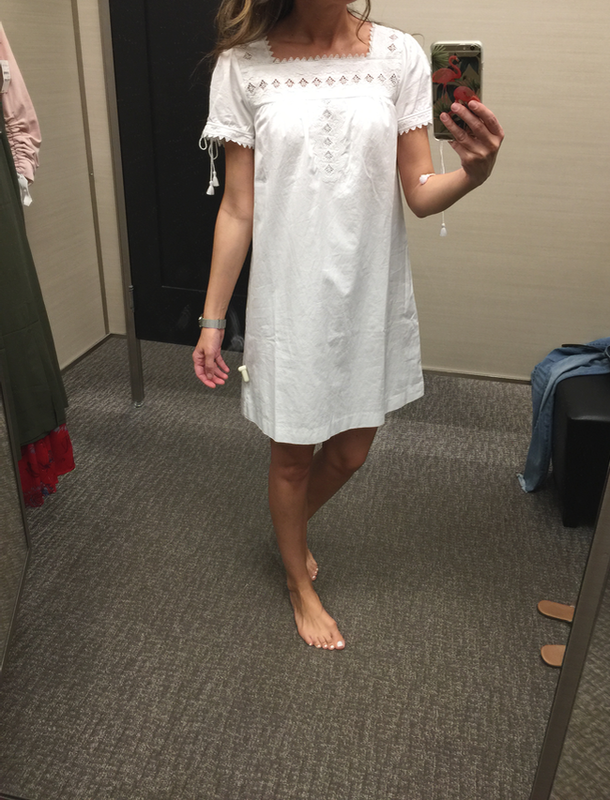 Linen Dress – also a size too big (need size 0) but oh-so-pretty! And comfortable. You guys, I wish I would hate these dresses but I’m loving them. They’re so cute and this striped one is no exception. Prettier in person and very comfortable. This skirt is beyond adorable. Runs tts. 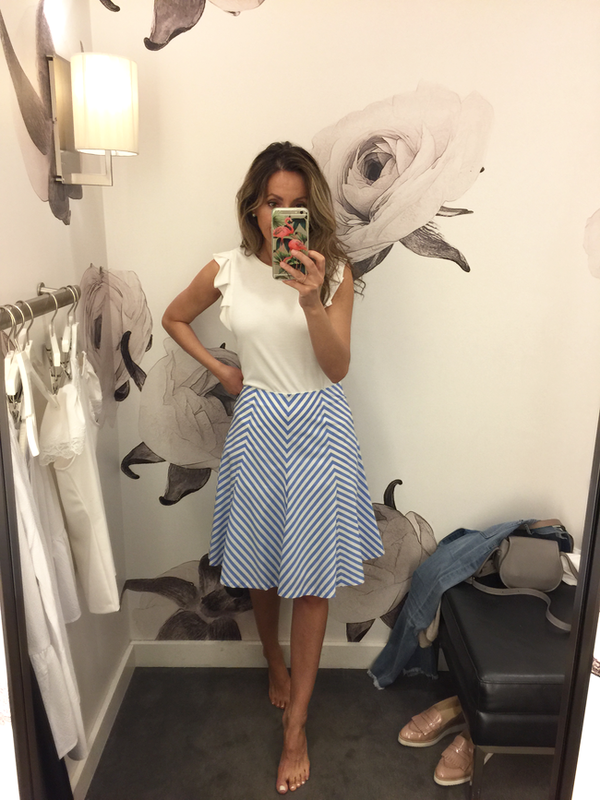 Top in XS- I might have found the top I needed for a specific skirt. I love the style and the subtle ruffle cap sleeves. 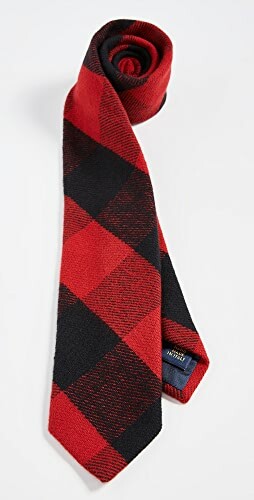 I’m not crazy about the fabric but I think I like the style enough, and it goes with everything…that this might be a keeper. It comes in more colors. Skirt tts really like this skirt / Lace Flutter Top – cute but not cute on me. 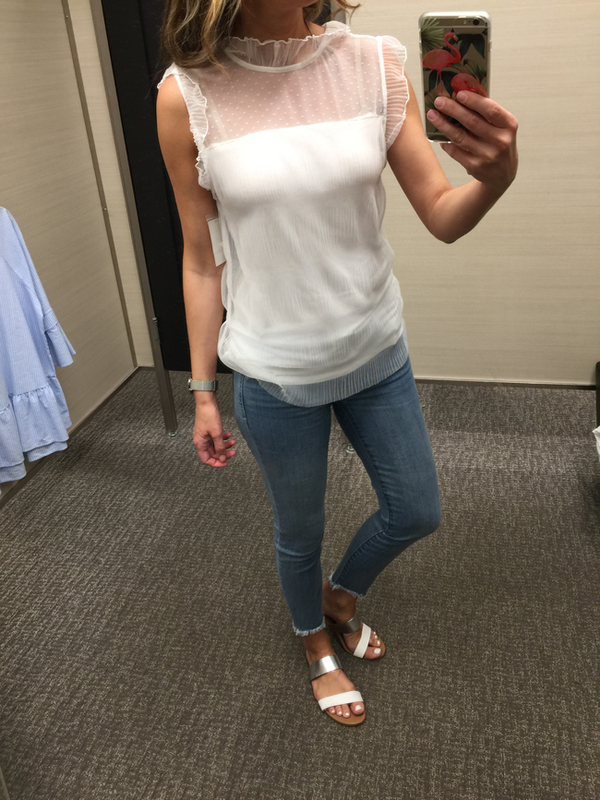 Lace top (here in Small but mannequin had my size on, yay!) 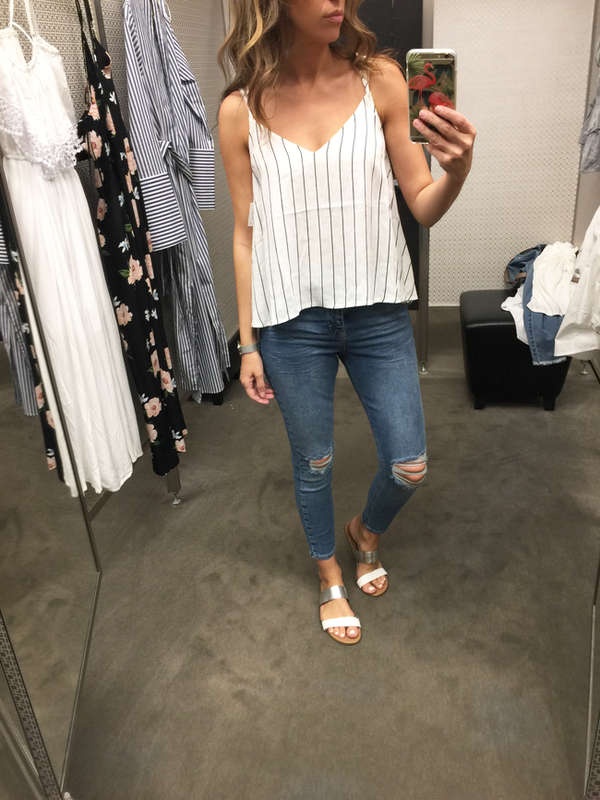 Loving this top which will work great with high-waisted jeans and high-waisted skirts. 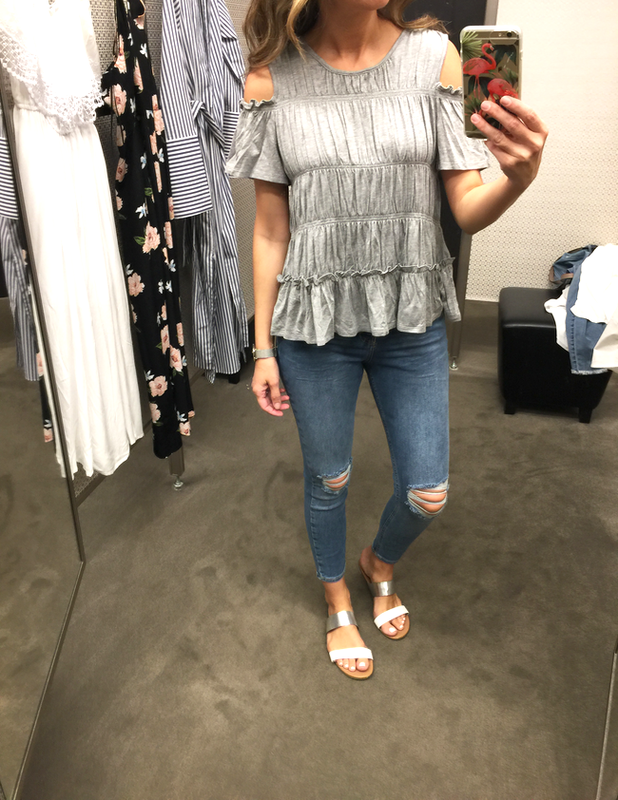 Ruffle Sleeve Top in xs – you NEED this top! The sleeves are not over the top and it’s comfy. The tee looks great on and it’s quite comfy. The sleeve detail adds a nice little touch to an otherwise plain tee. Easily dressed up or down. Again, love the cute detail on the sleeves. 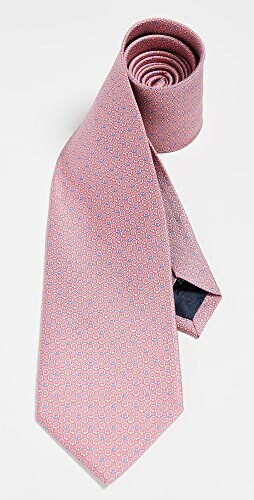 Cute, comes in two other colors, but I wasn’t too wild about the fabric (can you tell I’m not picky when it comes to fabric?!). It’s a tad wide but that’s the style of it. 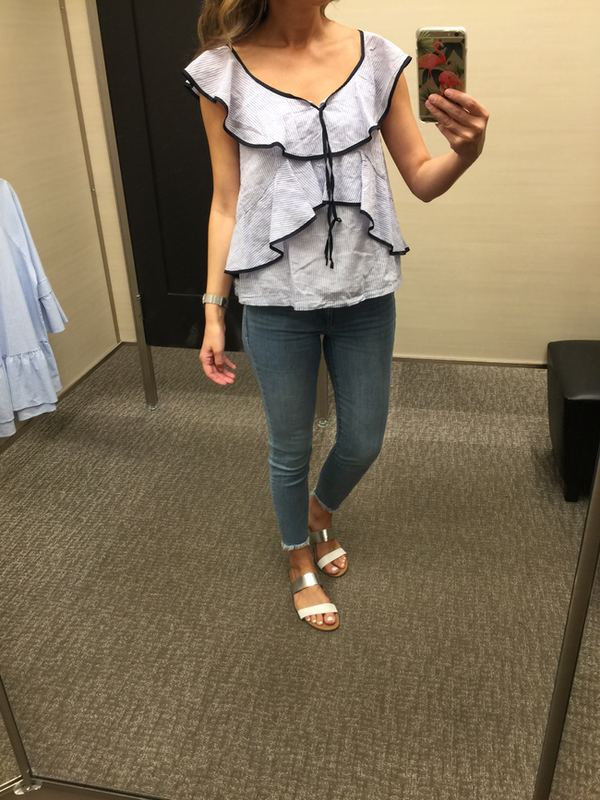 I tried this top on in blue quite a while back. While I love it, it didn’t come home with me. I’m loving it in white too, clean and crips and it just looks really nice on (prettier in person). 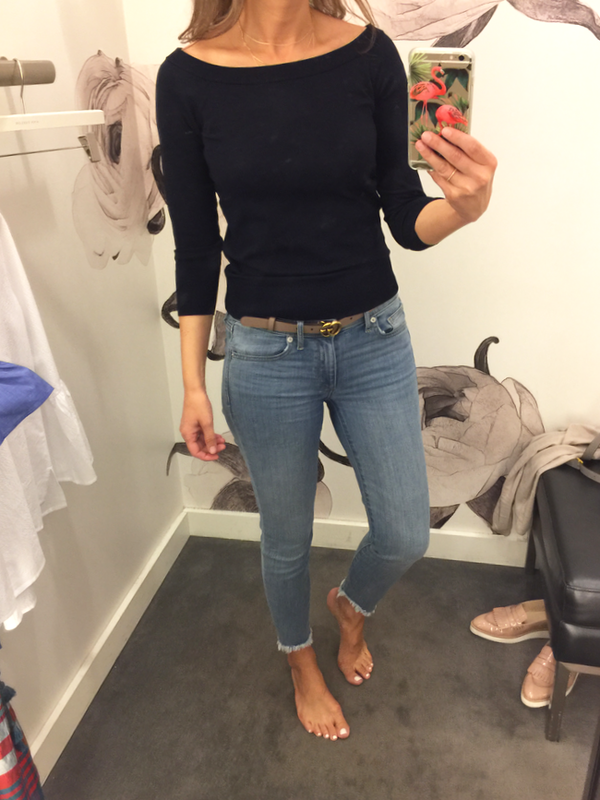 I love that this light sweater can be worn as a boat-neck style AND slightly off the shoulder. Super nice! It runs a bit small. If you prefer it very fitted than stick to your size. 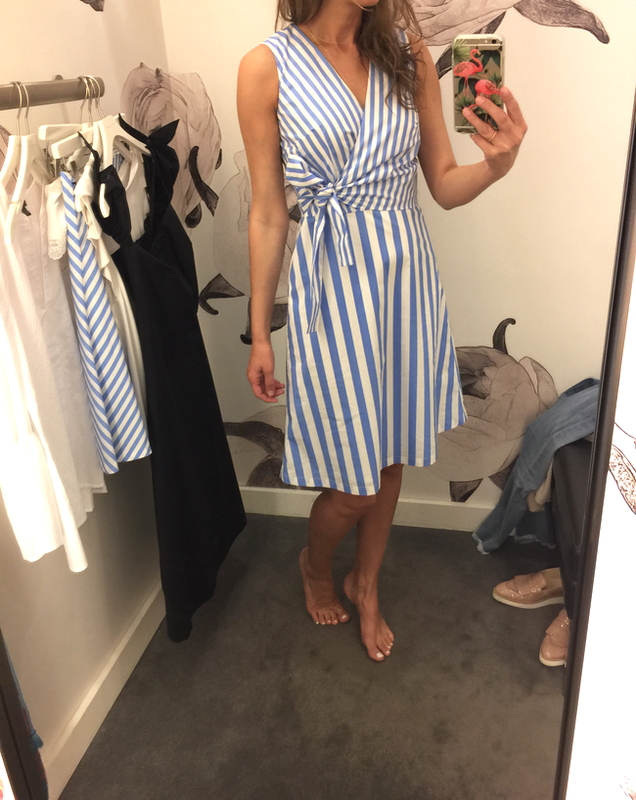 Also comes in this pretty color, striped. 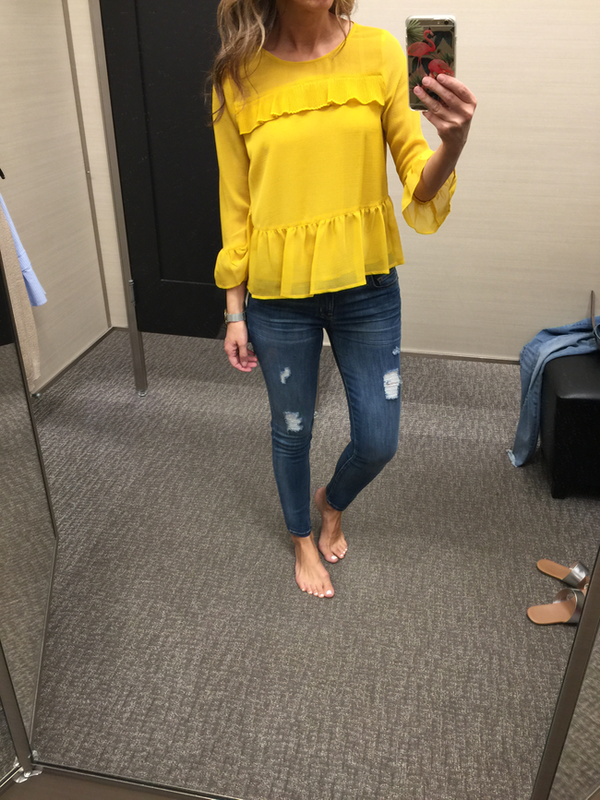 Lace Puff Sleeve Tee in xs – I’m loving all these tops with cute sleeve details. 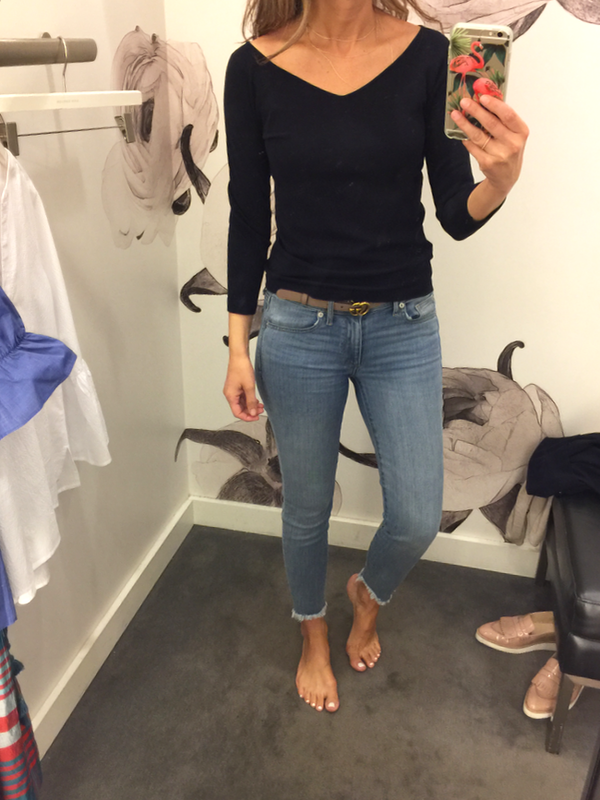 It’s been a while since I made it to Nordstrom…last fitting room snapshots here. 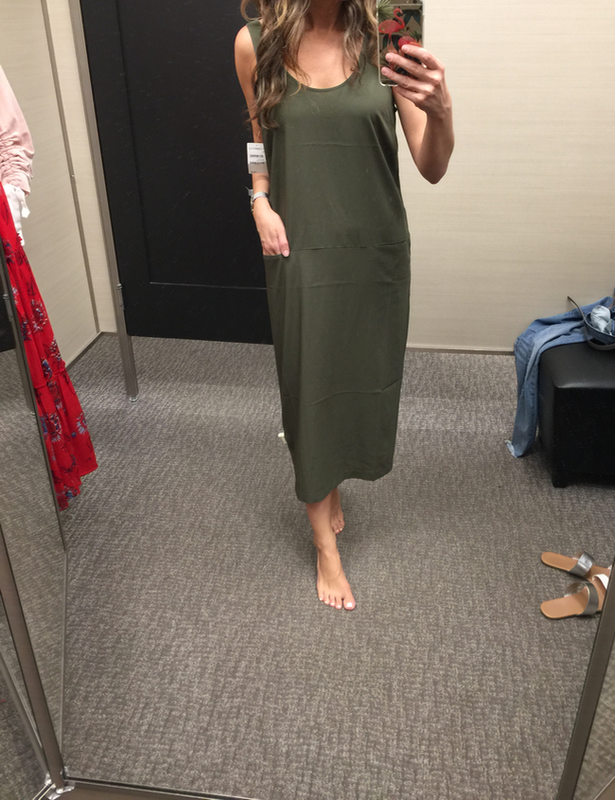 I’ll start with my favorite item – the dress below. My sister actually noticed it as were leaving. The smallest size available was size 6, which I almost didn’t try on, but I’m glad I did. This dress is absolutely beautiful. I’m pretty sure I’m size 2 but just to be safe, and not miss out on it, I ordered size 4 as well (even though I’m sure size 2 will be ok). Can’t wait for it to arrive. Dress – also loving this one, so pretty. LOVED this top. XS was sold out and small is way too big but currently all sizes are available online. 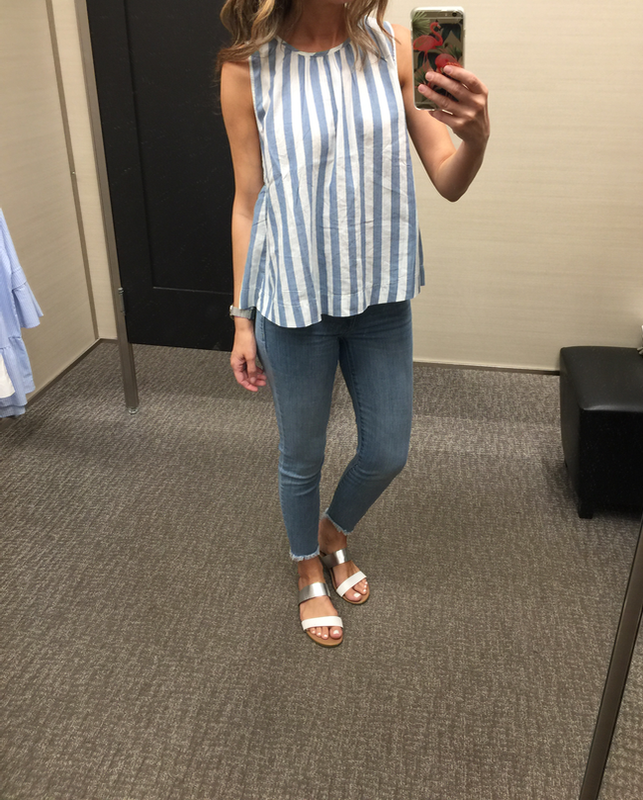 This top would have looked cuter tucked in and also in my size (this is small). Comes in two more colors. 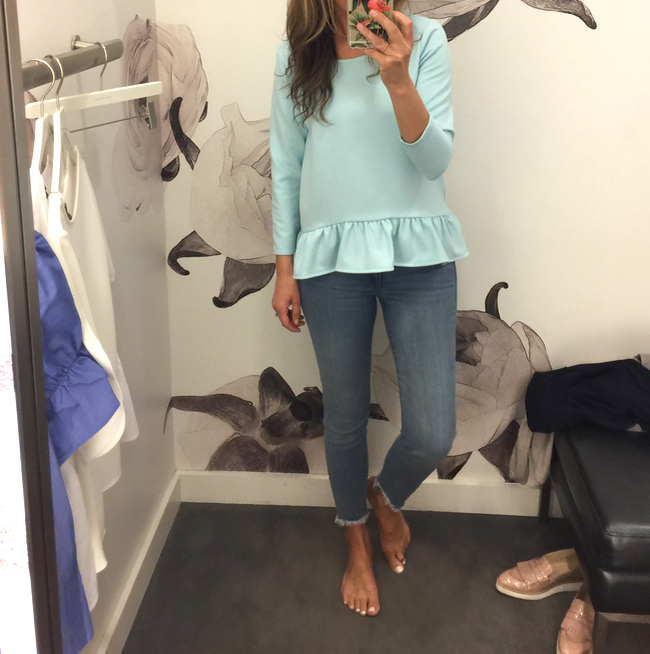 Peplum Top in xs – adorable! 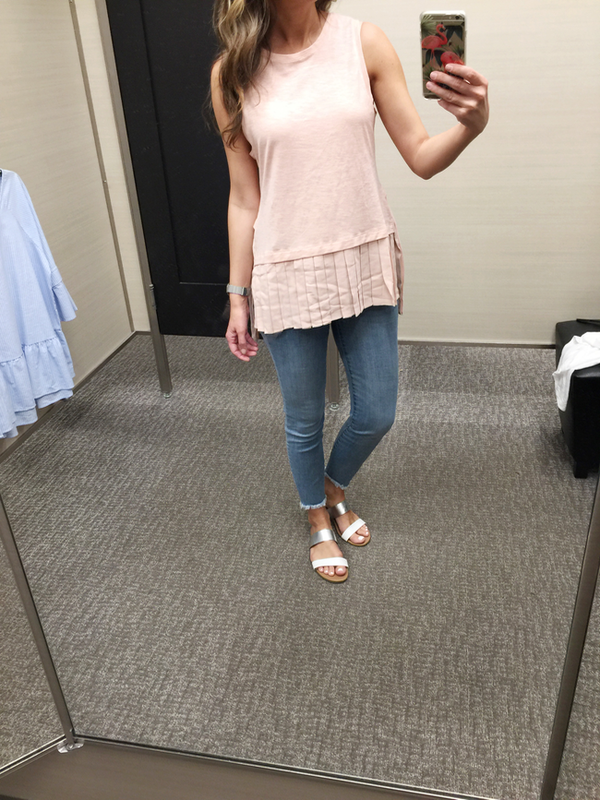 Off the shoulder top also in Coral Stripe – both on sale (other colors not on sale). 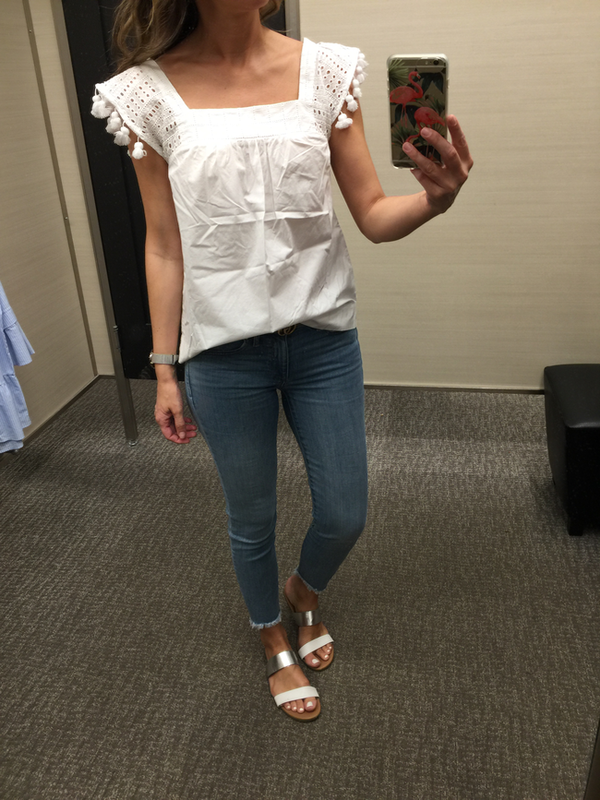 Eyelet top – so adorable. Comes in 5 more colors. 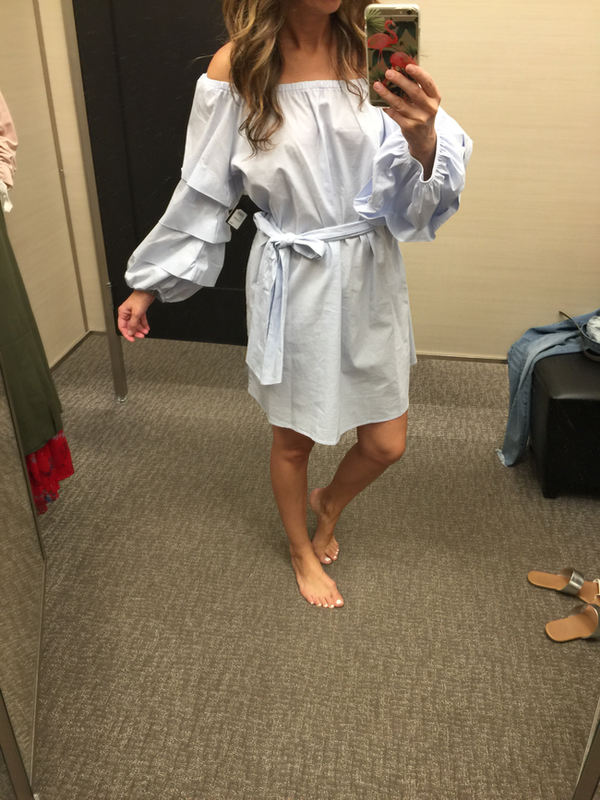 Off the shoulder dress (in a size or two too big but had to try it on. other than being huge on me, it is a cute dress). 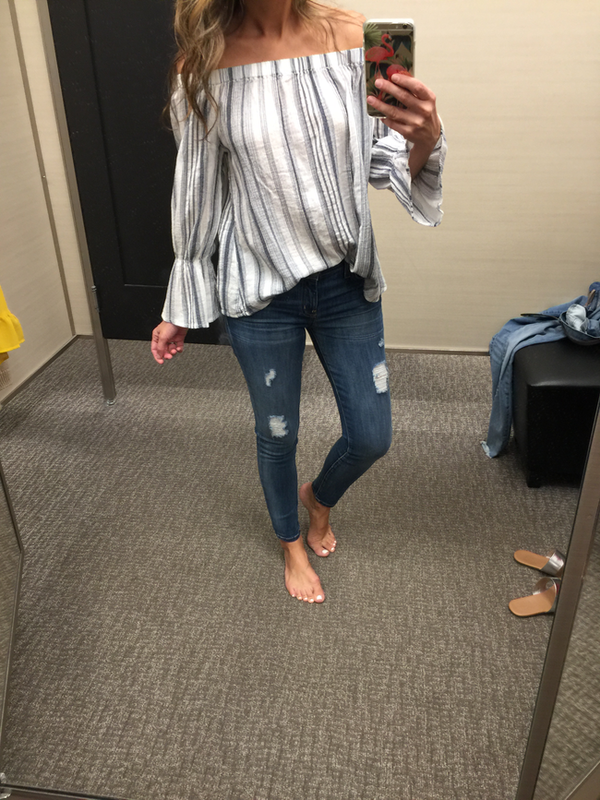 Ruffle Sleeve top in xs (this top should have ended my search for the top I needed. 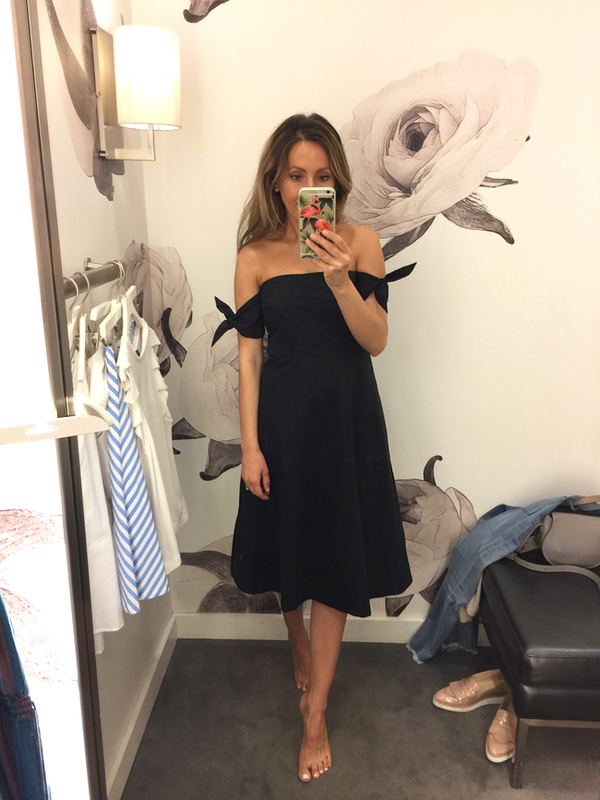 I wasn’t feeling anything I tried on, other than the dress I ordered…but looking at these pictures made me change my mind about a number of pieces, especially this tee). 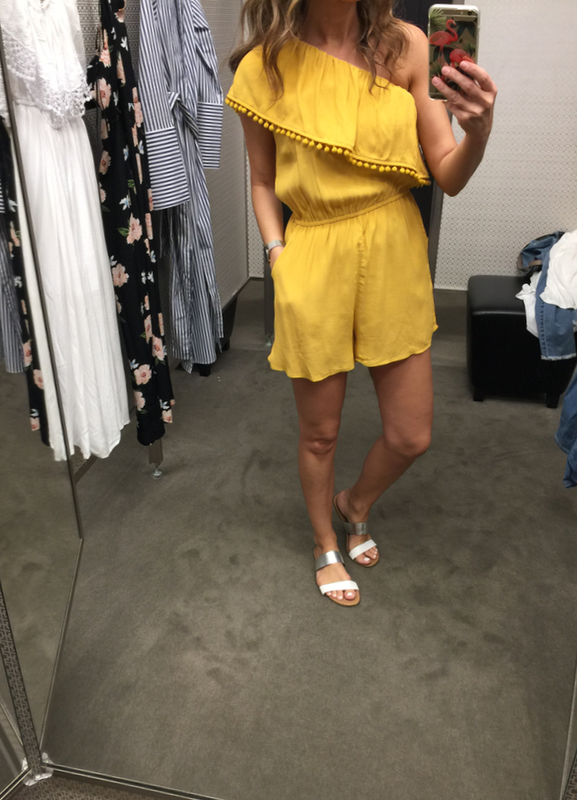 Romper in Small – adorable and not too short. Just not my color. Really pretty dress but as you can see on the picture the lining is too short (and side slit comes up to the lining). Jumpsuit (in US 6) LOVED how it looked on, other than being really low cut. It was flattering and just plain nice. Bummed about it not working out. 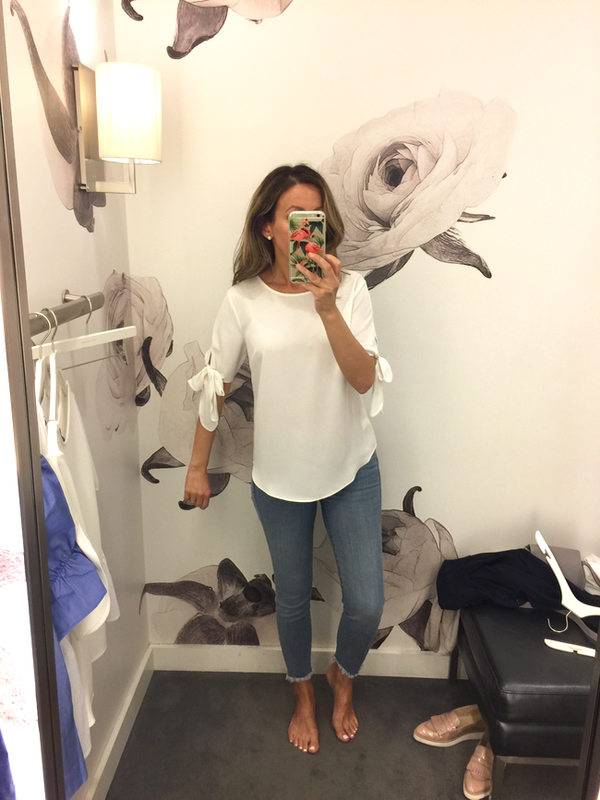 Ok, that was way too many fitting room snapshots. Which piece(s) is/are your favorite? Hi Lilly, Looks like a great day shopping! 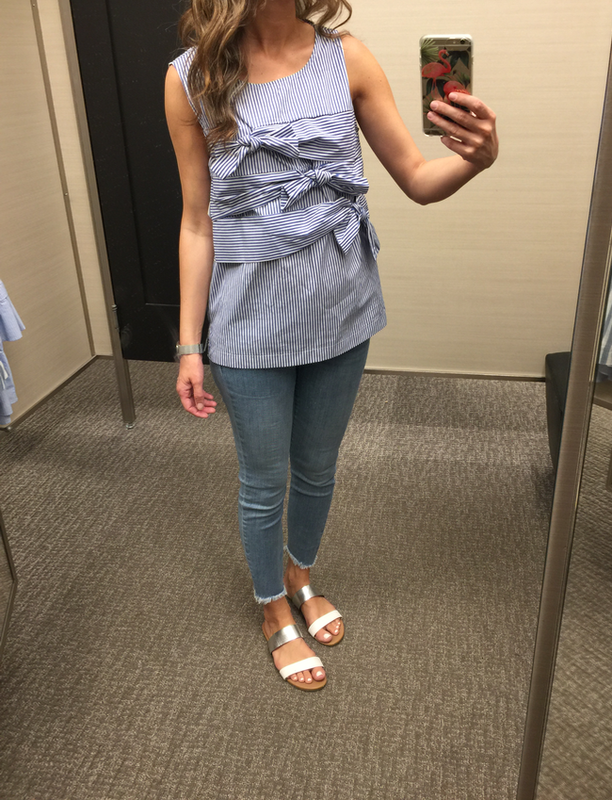 Too many cute outfits to pick only a few! That's always the problem lol. Wish I could take them all home with me. Always hard to narrow it down what to get. 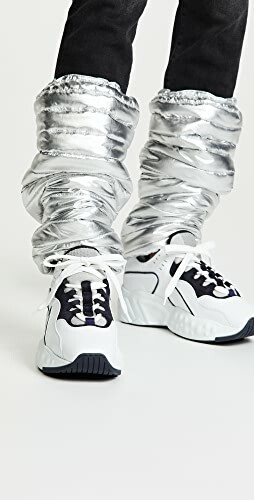 Hi, may I ask the brand of the silver and white strapped sandals shown in your Nordstrom shots? 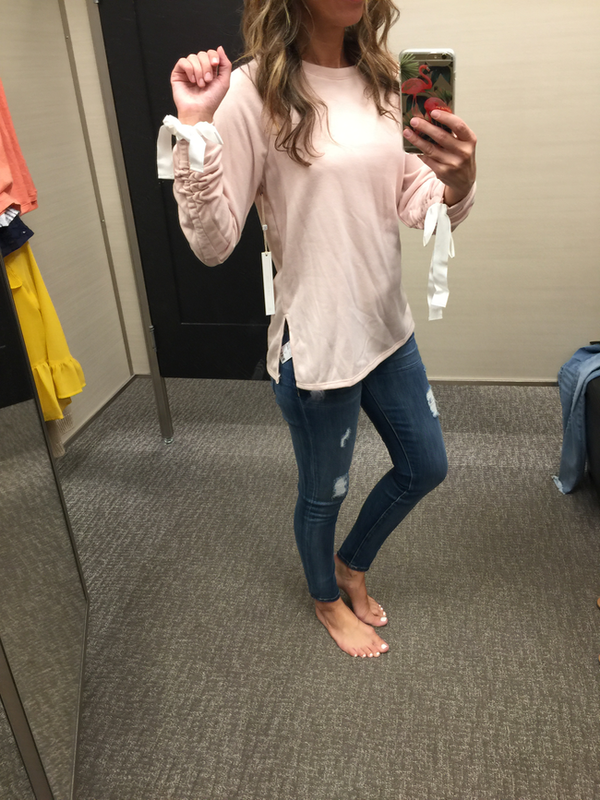 They look really cute with several of the things you tried on. Thanks for more awesome outfit ideas! 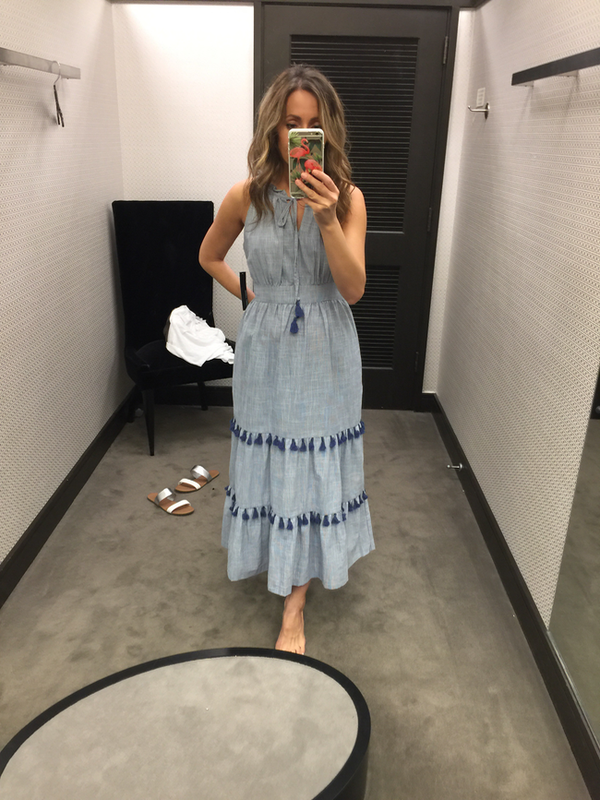 Hi Cory, the slides are from Kohl's (Lauren Conrad collection). 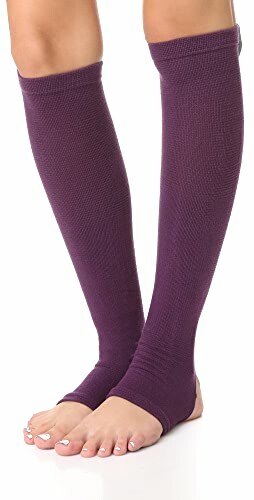 They come in 9 colors and are super comfy….and crazy affordable. Happy weekend! Gahhh! 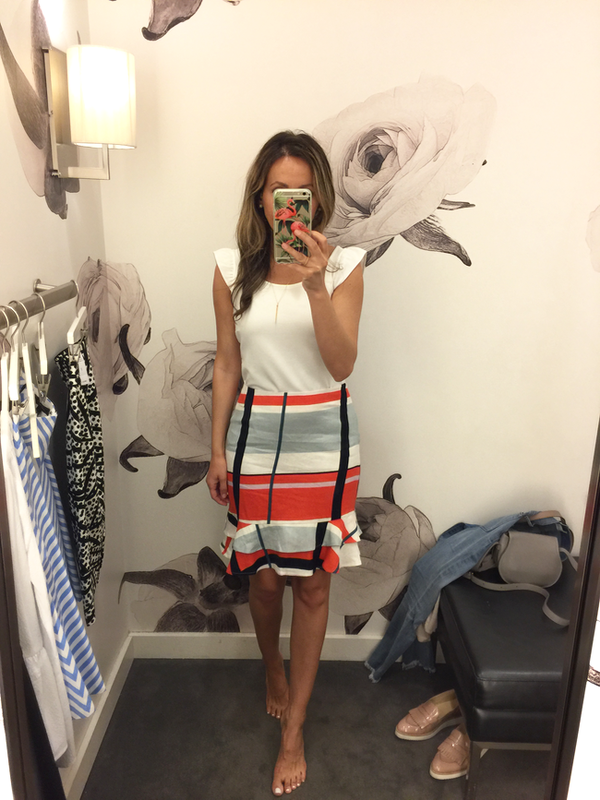 Absolutely loved everything you tried on at Ann Taylor! 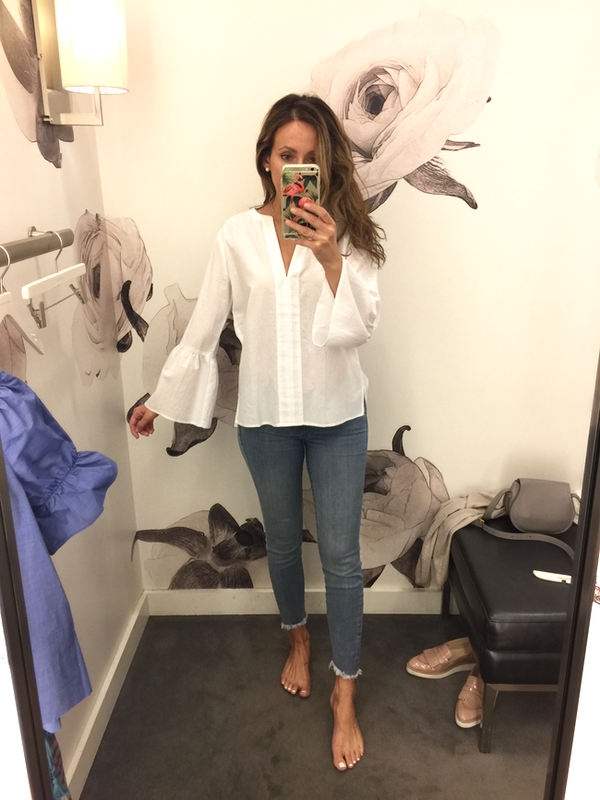 I'd have had a hard time picking what was coming home with me!I feel like your Nordstrom try on's are exactly how it goes for me. 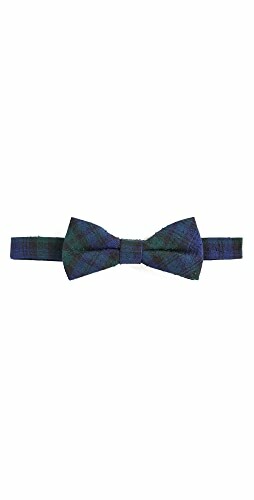 Like it, not in my size, sold out online. Things I barely look twice at on the hanger are darling on, and I wasn't even looking for anything like it…I did order the yarn tank earlier this week, because my neutral loving heart had to take a break from buying white tops…. with that said, I'd have easily wanted 4-5 of the white tops you tried on, in the search of "the one". Lol!! Great finds ! You must have been in the dressing room for at least an hour ! Shop Pumps Heels Shoes, Black Bralettes, Black And Gold Jewelry, Navy Leggings and more. Get this widget.